Everyday Fray: From A&K - Great Canadian Quilt Off, eh! We thought it was high time to have a little shindig here on the blog and nothing says fun like a bit of competition. Two blogger cousins, two quilts, one pattern....enter the Great Canadian Quilt Off, eh! We will both make the same pattern at the same time, using different fabrics and whatever means necessary to get 'er done in 4 weeks. Pretty cool, eh? What lovely quilt pattern will take top honours? Well majority rules here on the blog and one of our lovely readers voted for Rachel Griffith's Smitten earlier this month, so Smitten it is. Feel free to join in and make a Smitten of your very own (Canadian citizenship not required). If you want to play please leave a comment on this post telling us who you are and where you're from or email us at contact AT everydayfray DOT com and we'll put together a list of participants so we can all keep in touch and motivate each other. In case you are still on the fence, there are some lovely Smitten quilts to be found here, here, here, and here that might just tip the balance for you. Who knows, if this goes well we might even triple up and turn it into some kind of hat-trick (we couldn't help ourselves on that one, after all this wouldn't be very Canadian if we didn't include some kind of hockey reference). Welcome one and all to the Great Canadian Quilt Off, eh! 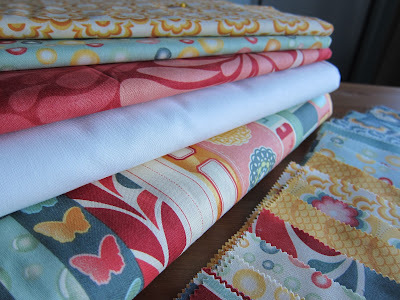 We'll be kicking Week 1 off on October 1st so be sure to swing by to read all about our fabric selections and how the whole getting started thing is working out.